SIMPLY BOOK ONLINE NOW for Weight Clinic today to get your dog or cat on the right paw! It's FREE! Overweight pets live shorter, less active, less healthy lives. Carrying extra weight puts extra burden on limbs, joints and the heart and can make a lot of existing problems much worse. 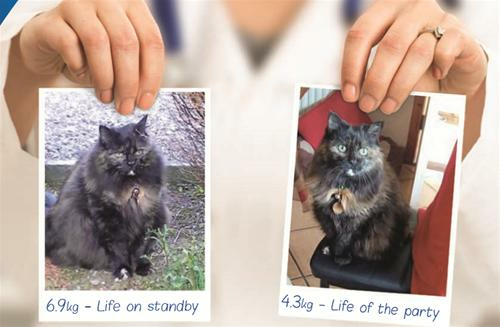 Recently, we at Cara Veterinary Group have experienced an increase in the number of animals who have developed conditions such as diabetes, arthritis, heart disease and/or joint problems which can be attributed to weight gain. In an effort to be proactive about this issue, we are offering our clients this complimentary service. To assist you in dieting your pet to his or her correct weight, and then keeping them there, Cara Veterinary Group provide a FREE Weight Clinic for Pets throughout the week. These clinics are run by our Veterinary Nurses and are free of charge. Provide advice on slightly overweight pets before this situation worsens. Pets nearly always become overweight from eating more food than they need, often coupled with a lack of exercise. The calories that are not used for daily activities are then stored as fat. Feeding the odd leftovers, frequent snacks or treats, often contributes to excess weight problems. Remember: a small snack for a person equates to a large number of calories for a pet. Feeding treats may also encourage your pet to beg at the table and pets are often very skilled at teaching their owners to feed them treats. Dieting is equally as hard for pets as it is for people and sometimes a little extra help is required. Simply, BOOK ONLINE NOW to book your Weight Clinic appointment today.